2000 Thermotron mdl. SE-600-3-3 Environmental Test Chamber s/n 30268 w/ Digital Controls. 2000 Thermotron mdl. SE-600-3 Environmental Test Chamber s/n 26507 w/ Digital Controls. 1999 Thermotron mdl. SE-600-3-3 Environmental Test Chamber s/n 29508 w/ Digital Controls. (6)Ando AQ6317 OSA3 Optical Spectrum Analyzer. (2)Ando AQ-6315A Optical Spectrum Analyzer. Advantest Q8384 Optical Spectrum Analyzer. Ixia mdl. 1600 Traffic Generator / Performance Analyzer. (2)Ixia 400T Traffic Generator / Performance Analyzer. Exfo OmniBER OTN Communications Performance Analyzer. 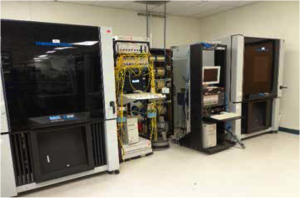 Agilent OmniBER OTN Communications Performance Analyzer. (2)Agilent OmniBER 720 Communications Analyzer. (4)HP OmniBER 719 Communications Performance Analyzer. (3)Agilent OmniBER 718 Communications Performance Analyzer. Tektronix CSA8000 Communications Signal Analyzer. Agilent MP1580A Portable 2.5G/10G Analyzer. Agilent 86130A 3.6Gb/s Error Performance Analyzer. (2)Agilent 86121A WDM Channel Analyzer. (8)Anritsu MP1632A Digital Data Analyzers. HP 70843B Error Performance Analyzer. (2)NetCom SmartBits 6000B Performance Analysis System. (5)NetCom SmartBits 2000 Performance Analysis System. NetCom SmartBits 600 Performance Analysis System. (3)NetCom SmartBits 200 Performance Analysis System. (2)NetCom SmartBits 10 Performance Analysis System. Fujikura FSM-30R Arc Fusion Splicer. Fujikura FSM-20CS Arc Fusion Splicer. Spools of SMF-28 CPC6-Coat Fiber Optic Cable. LuxN WavStation LX11106 Test Chassis. (30)LuxN Wave Station, Wave Farer Test Chassis. (2)Exfo PM-1600 High Speed Power Meter. (3)Exfo PM-1100 Optical Power Meter. Exfo FOT-90A Fiberoptic Power Meter. Fluke 26 III True RMS Multimeter. Fluke mdl. 77 II Multimeter. Fluke mdl. 75 III Multimeter. (2)Fluke mdl. 70 III Multimeter. (2)Fluke mdl. 45 Dual Multimeter. (7)Sorrento 15V GigaMux Power Supplies. HP 6236B Triple Output Power Supply. (2)HP E3631A Triple Output DC Power Supplies. (2)HP E3620A Dual Output DC Power Supplies. Agilent 6655A System DC Power Supply. Agilent E6314A DC Power Supply. Agilent E3620A Dual Output DC Power Supply. Agilent E3614A DC Power Supply. (2)Hakko mdl. 850 SMD Rework Station. Hakko mdl. 928 Soldering Station. BP Microsystems BP-1400 Universal Devise Programmer. Advin Systems Pilot-U84Plus Universal Programmer. Digital Lightwave NIC-Plus Network Information Computer. Large Quantity of Network Inventory. NEC DSX-80 Key Telephone System. Conference Table and 10 Chairs. TurboAir mdl. TGM-48R 2-Door Refrigerator. (3)HP ProCurve 2510-24 Network Switches.